Make sure your email marketing does not cost you thousands in legal fees. 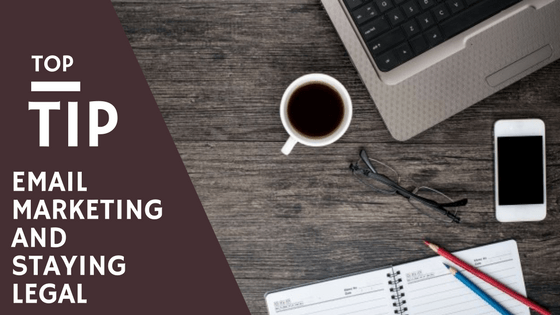 There are a lot of questions about email marketing in forums and groups, with people not fully understanding the need for some information that is necessary on any email marketing materials that go out. I have combined a few facts on why such requirements are in place and how to stay legal when using email marketing campaign services such as MailChimp or Convertkit. Recipients must know your address. The biggest bug bear in all business owners is the need to have their address on emails. Small business owners who work from home are not always comfortable providing their home address to the subscriber list. However, it is a legal requirement to provide your address, and clearly identify your company name. If you do not wish to use your address it may be possible to use a PO Box (check with your email marketing campaign provider) as long as that address can receive physical post. Majority of recipients will have opted in through a subscription form on your website, and social media platforms. These are subscribers that have given consent. There is also a soft opt in approach where those that have purchased your products and services can be added to the subscriber lists also, this needs to be made clear to them at the time. You cannot buy marketing lists as many of these are compiled without the recipients consent and can cost your business if pursued. In the UK there is fines up to £5,000 for holding an individual’s details who did not give you permission and using it to market. In the US this can be up to $16,000 worth of fines – it is also illegal in the US to purchase mailing lists. Even if a recipient requested to join your mailing list, they may later change their mind and therefore need a way in which they can opt out. Past customer may no longer be interested in your products/services and will also want to opt out. Many email marketing service providers will make it a requirement that at the bottom of every email is a small print providing a link to unsubscribe. If you do not use a provider then you need to provide a way for subscribers to opt out, either through replying with a request or a link. These subscribers need to be removed as quickly as possible (many companies suggest a 48 hour turn around) to comply with the law. If a subscriber cannot opt out or has not been removed from a list your company can be in legal hot water. The information provided in the header – items such as originating domain name, recipient and sender names and emails need to be correct – is necessary. Providing false information can mislead readers and if it is not clear who is sending the emails you may receive a large amount of opt outs. Email campaign providers may suspend your accounts if you have a large number of opt outs, this is to investigate the way in which you obtained the emails addresses. If you are selling something in your email, then you need to tell the recipients. Catchy subject lines to grab reader’s attention is all well and good but it is necessary to make sure that the subject line accurately reflects what is within the email. Even if it is a discount code to use on your website, this needs to be made clear. Not all Email Marketing Providers allow selling in the emails. If you want to send an email out with lists of items with buy links be very careful. Some email marketing providers will now block such accounts as they are more at risk of producing high level opt outs which reflects badly on the provider. Most businesses affected by this is MLMs, however I have discussed with some providers ways around this and more than happy to advise people who are interested. Just pop me a message across. All the email marketing providers will automatically input a lot of the required information in your emails, it is your responsibility to check they are accurate and up to date, as well as the honesty of your content. Email marketing campaigns can be a great addition to any marketing strategy and when done right the results are well worth the effort.